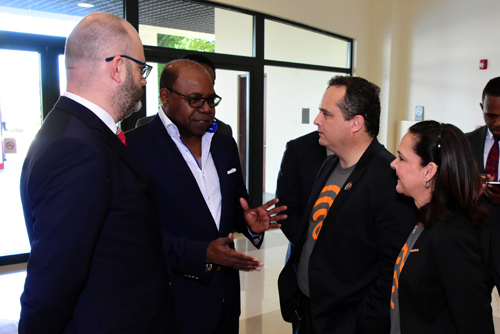 Edmund Bartlett, Minister of Tourism (2nd left) in animated conversation with Mauricio De Hoyos, Sales Manager for Aruba Networks – Latin America, and Gloria Saravia, Territory Manager for Aruba Networks, shortly after he was introduced by Darragh Fitzgerald-Selby (left), Head of Sales for Digicel Business. 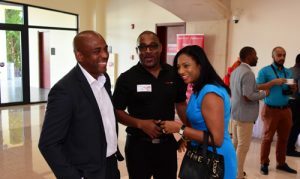 They were attending the Digicel Business/ExIm Bank Smart Destination Workshop at the Montego Bay Convention Centre on Friday. Minister of Tourism, Hon Edmund Bartlett, tells small and medium tourism enterprises that to get where they want to be, they have to be driven by experiential tourism rather than the traditional destination tourism at the 2018 Smart Destination Workshop held at the Montego Bay Convention Centre on Friday, May 11. “The seismic change that is taking place in tourism today is absolutely mind-boggling. And destinations are undergoing a level of metamorphosis that is faster than they can even recognize themselves,” said the Minister. MP for East Central St. James, Bartlett, announced that disruptions being faced come from operators out of Japan who are now dealing with robotics and utilizing Artificial Intelligence to show virtual and augmented reality, to create experiences that are predictive so the visitor/customer/consumer can have a level of knowledge and information about what is happening in a particular destination. They are making decisions on the basis of these experiences and they are predicting the outcomes and buying against their predictions. Brian Bennett-Easy (L), General Manager for Digicel Business, Ricky Purkiss (C), Digicel Business Corporate Sales Manager and Odette Dyer (R), Regional Director for the Jamaica Tourist Board, share a light moment just before getting down to business at the Smart Destination Workshop for small and medium-sized tourism enterprises to receive creative financing and technology options for the latest smart innovation in the hospitality industry. The event was held at the Montego Bay Convention Centre on Friday. Ative Ennis shared similar sentiments, arguing that Millennials are demanding personalized travel which allows them to have unique experiences in the areas of cuisine, entertainment and other aspects of cultural and local interactions. “The hospitality sector must test new ideas and take an analytics-enabled approach to innovation,” he stated, adding that Big Data and Artificial Intelligence can to help gain meaningful insights into guest behaviour. Minister Bartlett says that innovation is taking everything we know and have been accustomed to by adding value, enabling more to be achieved from less in terms of creative outlet, greater value, quantitative measure and economic enrichment. He urged all to “wake up and smell the coffee” because tourism is a brand new mega global industry, “with $8 trillion value last year, 10% of global GDP, 313 million people employed in 2016 and the figure for 2017 went up to 400 million”. He explained that the only industry ahead of tourism in terms of contribution to GDP is the financial services at 19%. In an illustration, Minister Bartlett explained that the Agri-linkages Exchange (ALEX) app that has been benefitting farmers and by extension, enabling tourism’s success is maneuvred from a smartphone which further highlights that technology is enabling Jamaica’s tourism sector to achieve more from expending fewer resources. Jamaica, being the most tourism-dependent nation in the world, has 1 in 4 workers within the Caribbean employed to tourism and 31% of the GDP of the region is from tourism.